Vortex might not be that known, but this project by German artist Marcus Stiglegger did release three albums before this one. Being inspired especially by cinematic concepts, ritual heritages and spiritual subjects in general, Marcus permanently searched for conceptual sources to create his evocative Music. 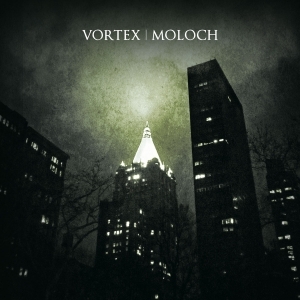 With Moloch, Vortex (excerpt from the bio) ‘crafted an apocalyptic soundtrack for urban decay’. It’s named after an Ammonite king / prophet / god, worshipped in the archaic Middle Eastern / East-Mediterranean culture, whose power resulted out of the sacrifice of young kids or, in a later stage, precious and valuable objects (often, and then I am referring to the contemporary civilization, used in a metaphorical way). When Marcus was in New York some centuries ago (okay, I like to exaggerate from time to time), this ‘moloch’-alike presence continuously crossed his path, being an entity in that metropolis, defining the demonic presence of being wandering around in the heat of the city. Being extremely intimidated by crowdy places myself (-Ivan-), I can understand the overwhelming experience he did, and with his visual experimentation (the reason why he got there fifteen years ago), he surely encountered those demons, those spirits and entities, those beings that differ from the average human being. The artwork, by the way, on this album, is inspired by quite the same experiences and adventures from Marcus’ visits to New York. He felt as if he were the ‘moloch’ too with his ability, or lust, or urge, or need, to register everything with his camera lens (and eventually in an aural manner). So, the cinematic approach of this album has already been explained. Anyway, this release comes in an edition of 500 4-panel digipack copies with a 32-page (!) booklet. It consists of eight tracks that clock almost one hour, and it gets released by one of the best labels, to my opinion, within the Ambient / Drone / Ritual scene nowadays, Cyclic Law from Berlin, Germany. Urban decay is quite present throughout this fine journey, a travel through the conscious and the unconscious (and I might not forget about the sub-consciousness, of course). The album is like a post-apocalyptic, trans-dimensional expedition, searching for the truth, the inner and outer self – which aren’t always that nice, that beautiful, that enjoyable. By creating long-stretched, ominous waves of droning Dark Ambient, Marcus succeeds to take you on an adventure through unknown worlds that are both attractive and repulsive. His mesmerizing walls are like a confrontation with your own being, focusing on the insignificance of man’s individual importance. Yet then again, making abstraction of any philosophical approach, the Aural Art is oh so fabulous to experience. Oppressing and suffocating waves of Doom-Drone built a world of mostly abyssal Dark Ambient, based on interwoven layers of synths, and added by violin, electric and acoustic guitars, pounding drums, eerie piano (though I am not totally sure about this one), something like a trumpet or sax (? ), and ritual percussions. On top of it, some sampled soundscapes and field recordings have been added to darker the whole thing even deeper, leaving the listener gasping for air. A surplus is the equilibrium in between long-stretched, monotone soundwaves and energetic, enthralling excerpts at the other hand, nicely balanced in presence and style. Some of the more agitated excerpts make me move my (athletic, muscled and trained) torso, while parts of inherent tranquillity rather make me dream away, float away towards post-cosmic dimensions within the Inner Self.